Developer Quote: "It’s Christmas time and the perfect opportunity to get in the holiday spirit!" 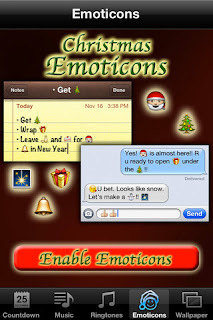 - Christmas ringtones for your phone! With this app, I've been counting down the days since December 1st myself, but what I enjoy most are the Christmas ringtones and the streaming radio. Just select your preferred activity by tapping one of the tabs at the end of your display. (There is a top in app purchase of 99 cents if you wish to get the premium version, and you will see a 99 cent purchase tag appear when trying to get ringtones). The many festive options to Christmas are enjoyable, while the beautiful, high-quality graphics in gorgeous color will definitely get you in high holiday spirits, if you aren't already there! COOL CONCLUSION: "Christmas brings the joy of Christmas to your home and is even more enjoyable in its simplicity and many activity choices."